When it’s finally time to replace that old, lumpy mattress, there’s more to consider than just its size, comfort level and price. You’re also going to need a quality bed frame to support the new mattress and protect your investment. The right bed frame and headboard combination can also add a decorative touch to the bedroom that reflects your personality and lifestyle. Basic bed frames are typically made from metal or wood, and consist of head, foot and side rails that support and hold the mattress and foundation in place. Ornamental headboards and footboards, such as Legget and Platt’s Argyle, can be attached to the head and foot rails to give the room a designer look. Rectangular-shaped bed frames are supported by feet attached to each of its four corners that keep the mattress and foundation off the floor and away from the cold air. The feet on some bed frames have glides or wheels called casters that make them easy to move for cleaning beneath the bed or rearranging the room. Depending on weight, larger mattresses such as queens, kings or California kings may also need one or more center-supporting rails, as well as an extra support foot on both side rails. Legget and Platt’s Inst-A-Matic Heavy Duty Bed Frame is a good example of a typical bed frame. Platform beds are a variation of standard bed frame support systems. They typically consist of a one-piece welded steel framework with a built-in foundation made from either heavy gauge cross wires with a series of metal slats placed laterally between the two side rails or a solid panel that holds up the mattress. Low profile platform beds eliminate the need for and expense of box spring foundations, and many also feature built-in, beneath-the-bed storage drawers. A good example of a platform mattress support is Legget and Platt’s Atlas Base, which is available with optional two- or four-drawer storage. Bed beams are a form of mattress support that use steel suspension beams in place of slats to hold mattresses in place and prevent them from sagging. The beams are stronger than traditional wooden slats, which is important when they are used to hold up thicker and heavier-bodied mattresses, such as those made from latex. The beams, which are placed laterally between the bed frame’s two side rails, are supported by individual legs that can be adjusted to balance and level the sleeping surface. A good example of a bed beam support is Knickerbocker’s heavy-duty BedBeam Bed Support System. 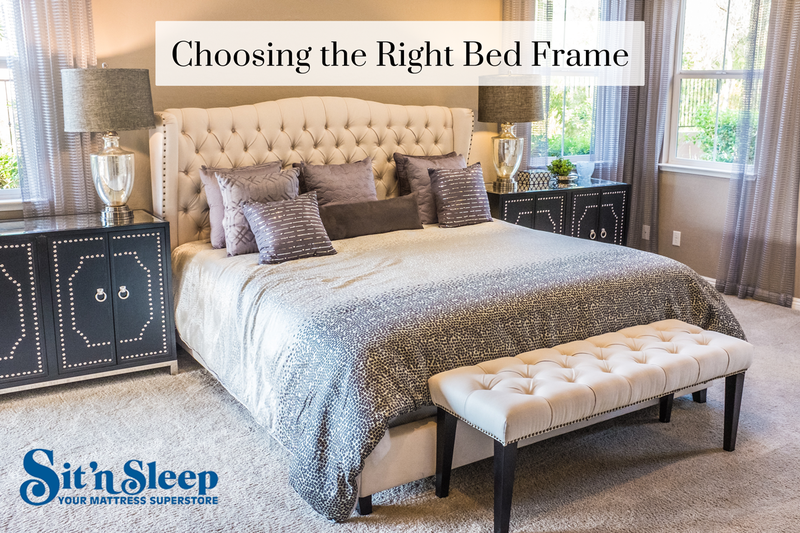 Regardless of the bed frame type, another important feature is that it be adjustable to ensure a proper fit, since mattresses can differ slightly in length and width among the various manufacturers. An adjustable bed frame is also important when a mattress is replaced with a different size, such as substituting a king mattress for a California king or replacing a child’s standard twin or full mattress with a longer XL model when he or she outgrows it. Whether you’re looking for a basic metal bed frame, a steel framed platform or a bed beam suspension frame, you’ll find it at one of Sit ’n Sleep’s Mattress Superstores conveniently located throughout Southern California. Our sleep consultants are available seven days a week to answer any questions you may have and address all your sleeping comfort needs. Is Sleep Texting the New Sleep Walking?